The Doklam standoff has brought into focus once again the poor infrastructure that India has. As on date, only 27 roads' (963-km) of the 73 strategic roads approved for construction (totaling (4,643-km) along the Line of Actual Control (LAC) over 15 years ago have been completed. But the Comptroller and Auditor General (CAG) pointed out in March 2017 that even the roads that had been "completed" were not fit for use. Of 61 roads along LAC, 12 completed by 2012 and of balance 46, only seven completed by March 2016. Ironically, of the 14 'strategic railway lines' approved for western and eastern fronts, not one has moved beyond paper plans. MoS (Home) Kiren Rijiju told Parliament in July 2016 that the projects would be completed only by 2020, owing to the difficult terrain, adding, "The proposal was expected to be completed in the year 2012-13 but the executive agencies have not adhered to the time schedule due to very high altitude and mountainous, rugged and difficult terrain." These are grievous offences involving national security both by erstwhile governments that gave the contracts, as well as agencies that took the contracts, with CAG stating, "User feedback indicated that there were issues like improper gradient, undulating surface, improper turning radius, minimum passing places and unsatisfactory riding comfort in the 17 out of the 24 roads selected for audit. Even the six roads which had been completed at a cost of 164 crore were not fit for running specialized vehicles and equipment because of the above limitations." The question here is why were resources, terrain, climatic conditions and limited working season not taken into account? Why were there no quality control mechanisms for monitoring the quality of work? Why were there no mid-course inspections and corrections? And, now where do we go from here? What happens to the roads constructed unfit for use? Why have they been accepted by MoD / MHA, who pocketed what for accepting them and what will it cost the exchequer (read the tax payers) to make them fit for use. Will heads be made to role or is it going to be business as usual? In sharp contrast, China has built extensive network of railway lines, highways and metal-top roads through most inhospitably terrain to sustain over 30 divisions including 5-6 rapid reaction forces in the Tibet Autonomous Region (TAR). In August 2017, government has approved greater delegation of administrative and financial powers to the BRO for faster execution of construction projects. A chief engineer (CE) of BRO can now accord administrative approval of up to 50 crore, additional director-general (ADGBR) up to 75 crore and the DGBR up to 100 crore for both departmental and contractual mode of execution of works. Similarly, a chief engineer can now accept bids for contracts up to 100 crore, while it will be 300 crore for the ADGBR. According to a BRO official, "This will ensure the entire tendering process for a majority of the contracts will be completed at the chief engineer/ADGBR level itself." A CE will now also have powers up to 2 crore to outsource consultancy services, while it will be 5 crore for ADGBR, with DGBR having full powers beyond that. Moreover, the DGBR will now be able to procure indigenous or imported construction equipment of up to 100 crore. MoD has also approved policy guidelines for BRO to adopt the EPC (engineering, procurement, construction) mode of execution, under which it may engage big construction companies to take up road projects on a turnkey basis. 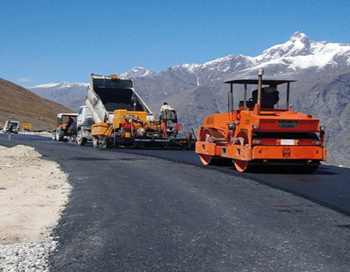 According to media reports, the government feels border road construction pace will now pick up with the BRO undergoing revamp under MoD; progressively equipped with more manpower, equipment and specialized machinery; faster clearances for land acquisition and environmental clearances; and, tunneling also being considered for better road connectivity. While all this looks good in theory, have we taken into account how many of the 27 roads completed are constructed by BRO and how many of these are in the "unfit for use" category? Are we not making the same mistake of poor indigenous defence production by putting everything through the DRDO? Where is the need to put all future construction 'through' BRO when commanders on ground are saying that roads built by private agencies are far better, even though they have been approached by BRO to plead that they should take up for all future construction through BRO. The Defence Minister needs to take a call on this and divide the construction of balance strategic roads between the BRO and private sector (not through BRO). This will also provide competition towards the quality of work and adhering to time lines. The completion of balance strategic roads by 2020 appears unachievable anyway. Simultaneously, work must also begin on the strategic rail lines.